A Burger King franchisee has added a burger burrito to the menu. The Whopperrito is now available at a Burger King location in Hermitage, Pennsylvania, reports Grub Grade. The ridiculous mashup takes a Whopper — beef, American cheese, tomatoes, lettuce, mayo, ketchup, pickles, and onions — and wraps it up in a flour tortilla. The Whopperrito is a regional product, sold only on a local level by a Burger King franchisee, a spokesperson told Business Insider. There are currently no plans to introduce the Whopperrito nationally. The Whopperrito test comes one month after Burger King debuted the Egg-Normous Breakfast Burrito in May. 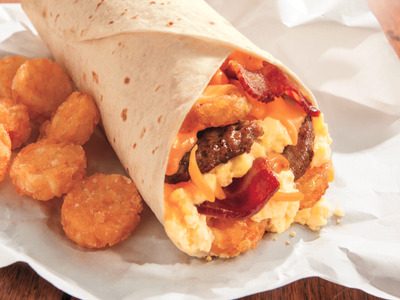 Following the launch of the Tex Mex-inspired breakfast item, all the ingredients for the Whopperrito should be found in the kitchen of ever Burger King across the country. In other words, even if your local Burger King isn’t officially serving up the Whopperrito, the burger-burrito may be a new entry to the fast-food chain’s secret menu. All it takes is swapping a bun for a tortilla.